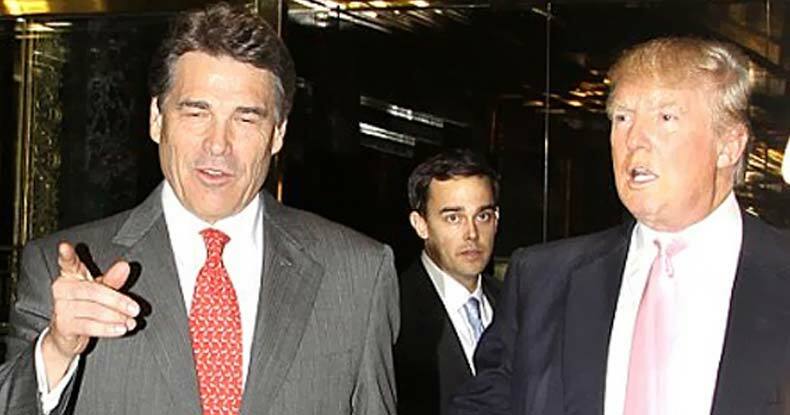 President-Elect Donald Trump has chosen Rick Perry — a sitting board member of the company responsible for constructing the Dakota Access Pipeline — for Secretary of Energy. While corporate media immediately criticized the choice as a troubling — particularly given the former governor of Texas once sought to eliminate the same department he’ll now head — Perry’s position on the board of directors of Energy Transfer Partners should not be downplayed. It’s been widely rumored the president-elect plans to remove all obstacles to the completion of the Dakota Access Pipeline — and a brief revisiting of Rick Perry’s involvement with the project evinces a high degree of truth to those rumors. Construction of Dakota Access is now technically on hold following a refusal by the Army Corps of Engineers to issue the easement necessary for the pipeline to run under the Missouri River’s Lake Oahe reservoir — the sole source of drinking water for the Standing Rock Sioux Tribe — until a full environmental impact study can be performed. Energy Transfer Partners, however, immediately balked and vowed to continue constructing the pipeline without rerouting from its current course — and unconfirmed reports indicated the company would or is doing so and plans to pay fines for ignoring the USACE denial of easement. With the DAPL project already fraught with controversy, this announcement from ETP quashed momentary celebrations by those opposed to the project — and refocused scorn against billionaire CEO Kelcy Warren and his company. Unsurprisingly, Perry’s status as an ETP board member is already expected to be a point of contention during confirmation hearings for his appointment to the DOE — but his ties to the Dakota Access Pipeline project have a decidedly crucial aspect the mainstream press appears to have forgotten. On February 3, 2015, while facing two state-level felony charges for abuse of power that were later dismissed, Perry landed a fortuitous spot on ETP’s board — a position not deemed suspicious due to the Texan’s healthy relationship with the oil and gas industry. In retrospect, it should have raised eyebrows. Except, there were conflicts of interest — staggeringly so — and Perry and ETP stood to collect a financial windfall from his convenient insider spot with the company, no matter how innocuous it seemed to have a Big Oil proponent on the board of a Big Oil company. Exactly one day prior to his appointment to the board of directors, Perry appeared in an interview for a local NBC affiliate to champion the Bakken Pipeline (DAPL’s alternate name) and explain to Iowans why they should support construction — a tough sell for many considering the crafty use of eminent domain to install the pipeline where property owners resisted it. Perry’s publicly advocating the pipeline would normally be expected given his longstanding Big Oil ties, but the timing of the ETP appointment the following day cannot be ignored — especially when further details are scrutinized. Perry’s position on ETP’s board of directors presented an astonishingly prime opportunity to ensure the removal of roadblocks the Dakota Access Pipeline faced in becoming an absurdly profitable project for investors — the lifting of a ban on the export of unrefined crude in place since the 1970s. When ETP officially proposed DAPL, the project was billed as an opportunity to break America’s dependence on imported foreign oil — but that claim was a flagrant perfidy from the start. Just one month after landing the spot on the board of directors, Perry began aggressively lobbying for a piece of legislation, H.R. 2029 — officially the Consolidated Appropriations Act of 2016, but better known as the leviathan omnibus spending bill — stuffed with a rider invaluable to Energy Transfer Partners’ future profits. Indeed, the voluminous bill carried multiple disparate but equally controversial measures — but none as critical to the oil and gas industry, and ETP specifically, as Section 101’s lifting of the ban on exporting unrefined crude. Dakota Access will transport Bakken sweet, light crude from North Dakota through South Dakota and Iowa to an existing hub in Illinois, where it will then make its way to the Gulf Coast. While ETP had originally touted the crude would be used domestically, H.R. 2029 — which was signed into law by President Obama in December 2015 — ensured no obligation for the company to keep the oil in the United States. Perry, together with the bill’s sponsor, House Republican Charles ‘Charlie’ Dent — who also stands to profit handily from the Dakota Access Pipeline — worked tirelessly for its passage. Now, still sitting on Energy Transfer Partners board of directors, Rick Perry will head the Trump administration’s Department of Energy — with all the flagrant biases and industry and corporate favoritism which paved the way for construction of the pipeline in the first place. With billionaire backers like Warren propping up Perry’s career, it would seem a foregone conclusion the appointment will stand. Opposition to the Dakota Access Pipeline by the Standing Rock Sioux and countless others might indeed need a Hail Mary at this late date — but as the movement against unnecessary oil infrastructure benefiting no one but the corporate elite and Big Bank investors continues to gain momentum, Perry’s handiwork cannot be ignored. Without Perry’s lobbying for Dent’s abhorrent bill, the export of unrefined crude might still be prohibited, as it had been since 1975. Finagling that one section of legislation essentially declared open season for Big Oil to run roughshod over the land in a free-for-all to ship U.S. crude around the world. And now he will become Secretary of Energy. People say the system is rigged for the rich and connected — and this is a prime example of why.